Beneath the glitter and gloss of Bollywood, there’s a very different reality being played out on the streets of India’s movie making capital. Director Mira Nair was one of the first to expose this harsh and often cruel world in her debut feature film Salaam Bombay! Gathering up a gang of kids who were eking out an existence on one of the city’s many rubbish dumps, she set about training them through a series of workshops. Soon she and her scriptwriter, Sooni Taraporevala, had both a story and a cast of naturals. In one scene, the street urchins are watching a typical Bollywood film, singing along, bouncing about in their chairs, and generally annoying the hell out of the other cinema patrons. When one cops a wallop for being too raucous, he swiftly retorts that he paid for his ticket and has just as much right to enjoy the film as anyone else. Movies are for the masses and nowhere more so than in India. But what, one wonders, would the kids have made of Salaam Bombay!? Escapism it ain’t. It has no dance numbers, no heroes nor heroines. Instead, it follows the trials of an abandoned 11 year-old country boy who finds himself struggling to survive in the thick of the bustling city. Shafiq Syed is heartbreakingly authentic as the barefoot Krishna, carrying tea through the streets to a variety of customers including a pimp (Nana Patekar), a prostitute (Aneeta Kanwar), their five year-old daughter (Hansa Vithal), and a recently arrived Nepalese virgin (Chanda Sharma). He even cares for Chillum (Raghuvir Yadav), a man twice his age fatally addicted to “the grandfather of all poisons”. It’s a lot for a young child to deal with but I reckon those kids in the cinema would recognise a lot from their own lives, just as we learn a lot by watching it. 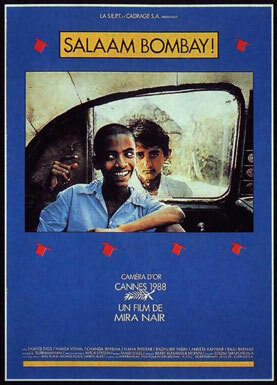 The film won the Camera D’Or and the Prix du Publique at Cannes and was also nominated for a Best Foreign Language Oscar. But it’s real legacy is the Salaam Balak Trust which cares for 5,000 street kids each year. Salaam Bombay! changed society’s attitude towards these children and continues to demand our compassion for them today.